Think about this: our feet help us get from A to B from the day we started walking to when we are elderly. So, it makes sense to make sure that we look after them from a very early age, doesn’t it? Children’s feet are the foundation for us to be able to keep walking and moving and it is incredibly important to support the feet at a young age to allow them to continue to support us throughout our lives! Parents have so many things to keep an eye on with their kids, but often the feet are overlooked until there is a problem. We’ve come up with a few things that you can look for to keep your little one’s feet in tip top shape! Have you ever seen a child and realise that they have grown a lot in a short period of time? So many physical changes are occurring through childhood that growth spurts are normal, but can sometimes be painful. All of the structures in the body are trying to keep up with each other as they grow and it is usually the legs and the feet that are the most painful as kids love to run. 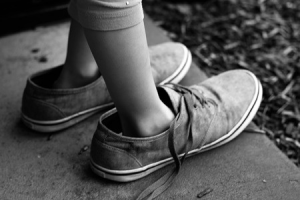 If your child has had a growth spurt recently, they may complain of pain in their legs and their feet when they come home from school or during the night. Usually, light massage and stretching often helps, however if you are concerned, visit us to have a thorough assessment! There are a number of growth plates in our legs and feet that can become very painful, particularly in children involved in sports which involve a lot of running and jumping. These growth plate conditions, known as osteochondroses, can occur in children aged 2-16 years of age. The most common osteochondroses that people are aware of is Sever’s disease which affects the growth plate in the heel. Other sites that are commonly affected are the knees (Osgood Schlatter’s), the navicular (Kohler’s) and the outside of the foot (Iselin’s). Generally, kids will complain of mild to severe pain at these sites which can stop them from playing sport altogether for a while. Often, the pain will linger after activity and into the night as a dull ache. This is most commonly known as being ‘pigeon toed’. Depending on the age of your child, there are various reasons why intoeing can occur and there is often an association between the hips, knees and feet. It is important that we ask about the child when they were in the womb, during and after the delivery and how they are progressing in their physical development to understand why intoeing is happening. Treatment is often conservative, including changes to posture, exercises and appropriate shoes. Toe walking occurs when the heel bone does not touch the ground, which can happen all the time or some of the time. Toe walking can be caused by developmental issues, however sometimes the cause in unknown. It is often associated with other conditions such as cerebral palsy, autism and muscular dystrophy. Children will often complain of pain or tightness in the calf muscles. Treatment can include stretching, night splints to help place the feet in the right position, or in extreme cases, surgery. Kids tend to trip and fall a lot of the time. Why? Most of the time it’s because they’re having too much fun running around that they don’t take notice of what’s in front of them, but sometimes it may be due to other reasons. As we learn to walk, we need to learn how to make our feet clear the ground, which is why you’ll often see babies with an exaggerated ‘stomping’ gait to let their feet clear the ground. Sometimes, the position and function of the hips, knees and feet do not allow our feet to clear the ground, leading to tripping. Tripping can also happen due to weak muscles or flexible joints that don’t support the body properly. We podiatrists could not tell you how many times we have had children walk into the clinic with shoes that were either too big or too small. In families where there are multiple children, hand-me-downs are very common, but are not always a good choice for the child they are being handed down to. It is so important that your children’s feet are protected by supportive footwear, and often you don’t need to spend the big bucks! As a general rule for both children and adults, there should be approximately 1-1.5cm of space between the end of the longest toe (often the big toe) and the end of the shoe. This ensures that there is still some room for movement but also allows the foot to sit perfectly in the shoe and be supported appropriately. There is no use buying a pair of shoes 2-3 sizes too big, waiting for the child to grow into them because that is almost certainly doing more harm than good. Try to have your child’s feet measured properly at a store which offers this service to be sure your child is wearing the right size. Children are bound to grow, so there may be some years where you have to buy more shoes that others, but your child’s feet will thank you in the long run! Ingrown nails can happen due to a number of things including trauma to the nail such as dropping a heavy object on the nail, incorrect nail cutting techniques, poor footwear that is too narrow across the toes or simply just the natural shape of the nail. Although not overly common in children, it is still possible that the nails can become ingrown and can be really quite painful! Infection often goes hand in hand with ingrown nails if they are not treated properly, so if your child is complaining of a painful nail it is best to have them checked by a podiatrist. The term ‘flat feet’ often has a lot of negativity around it, particularly in children. Most parents will state that their child’s feet seem to ‘roll in’ or that their ankles look ‘funny’. It is really important to note that feet are complex things, so there are a lot of things that need to be evaluated before giving the diagnosis of flat feet. In a normal walking pattern, it is normal for the foot to roll in slightly to help with shock absorption. As a child is learning to walk and run, often their feet may look ‘flatter’ than an adults. This is because they require the feet to be a little more flat to allow for shock absorption compared to adults. 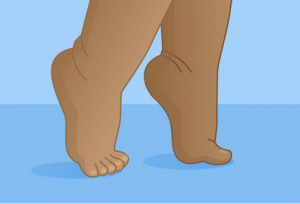 Often, flat feet in children are not painful and some resolve by themselves as the joints and the structures within the feet develop over time. However, there are always exceptions to the rule and sometimes flat feet can develop pain in the arch, the ankles and the knees. It is important to identify when this occurs and to see a podiatrist if you are concerned. It is quite rare for children to develop corns. Most of the time, they actually turn out to be warts. Warts are caused by the human papillomavirus and can be quite nasty and painful. Children are susceptible to warts as they do not have the immunity that adults do. They are common in children who participate in swimming as the pool deck provides the perfect environment for the virus to thrive, as it is warm and wet. There are a number of treatment options available for warts, some of which can be done at home. 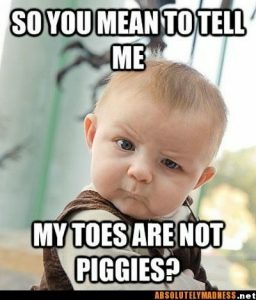 If you are concerned about your child’s feet, simply book in to have a chat with us here at Watsonia Podiatry! Let us take care of your little one’s little feet!